This is for high resolution files only. The other versions of this resource are free. 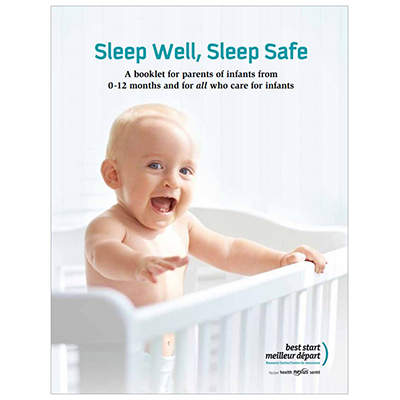 The Sleep Well, Sleep Safe booklet is intended for parents of infants from 0-12 months and for all who care for infants. Healthy Sleep Tips for Infants and for Parents : Be informed about recommendations on healthy sleep practices for parents and infants. Safe Sleep Tips for Infants 0-12 Months: Be informed on how to reduce the risks of Sudden Infant Death Syndrome (SIDS) and other sleep related causes of infant death. Frequently Asked Questions (FAQs) & answers and recommended resources: provide you with further information on healthy and safe sleep for infants. The safest place for an infant to sleep : Did you know that the safest place for an infant to sleep is in a crib, cradle or bassinet? in English and French. Attachment and sleep : Did you know that your infant needs your loving care to better develop healthy sleep habits? in English and French. Establishing routines : Did you know that routines are important to help infants sleep well? in English and French. Creating safe sleep environments: Did you know that creating safe sleep environments will reduce the risks of infant death? in English and French. Breastfeeding and Sudden Infant Death Syndrome: Did you know that breastfeeding reduces the risks of SIDS? in English and French. Alcohol/drug misuse and Sudden Infant Death Syndrome: Did you know that avoiding alcohol and drug misuse can reduce the risk of infant death? in English and French. Smoking and Sudden Infant Death Syndrome: Did you know that preventing exposure to tobacco smoke, during pregnancy or after pregnancy, reduces the risk of SIDS? in English and French.